In the absence of Wallander and a brief but enjoyable introduction to Zen, may I point fans of detective drama with a strong lead (character) in the direction of BBC4's The Killing, which is also available on iPlayer. 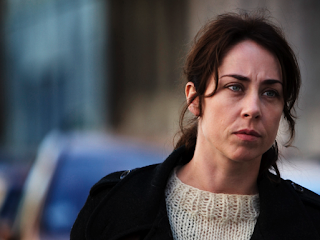 Sofie Gråbøl, pictured, stars as the head of a team investigating the drowning of a young woman, as if Twin Peaks had served as the inspiration for this latest import. Made in Denmark, its rhythms and atmosphere are (very slightly) reminiscent of Lars von Trier's haunting - haunted - hospital drama The Kingdom, Danish dialogue notwithstanding. The introduction of a politician and his cronies into the mix may have been a little more nuanced but otherwise The Killing displays an admirable interest for the ripple effect of a murder on investigators, victims and suspects alike. No doubt this will help it sustain a 20-episode run. UPDATE At past the halfway point, the series continues to grip, not least because it's so filmic; I fear the prospect of catching up on 12 episodes may be beyond most newcomers, though the BBC is very sensibly keeping them all on iPlayer. Before The Killing began, the Guardian focused on its female lead but the series is remarkable for its portrayal of powerful women at all levels of the drama: there's intuitive detective Sarah Lund; Pernille Birk Larsen, mother of the young woman whose death is the action's catalyst; luscious Rie Skovgaard, steely press spokeswoman for politician Troels Hartmann, who is heavily implicated in the crime and, of course, Nanna Birk Larsen, the murder victim who haunts every revelation with her Laura Palmer-like presence. The men with whom they interact are mere shadows in thrall to these formidable characters.